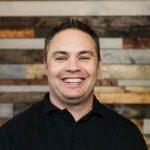 There’s no doubt that Google Analytics is an absolute must-have in every marketer’s toolbelt. It can help you track metrics that gauge your website’s growth, get to know your audience a little better, and figure out what works and what doesn’t in your online marketing strategies. An argument can be made that it’s the most comprehensive analytics platform out there that can help marketers make more data-driven decisions. And while that sounds awesome, Google Analytics has one flaw that some marketers may find annoying. Three words: not provided keywords. What are ‘Not Provided’ Keywords? Remember, a lot of marketers use Google Analytics to understand who their visitors are, where they are from, and what keywords they use to discover their site. Doing so will enable them to fine-tune their content strategy and everything else that require effective keyword research — from SEO (search engine optimization) to CRO (conversion rate optimization). While it’s nice to know that a free tool like Google Analytics enables you to identify keywords that generate traffic, condensing a huge chunk of keywords into a single, unlabeled group is definitely counterintuitive. 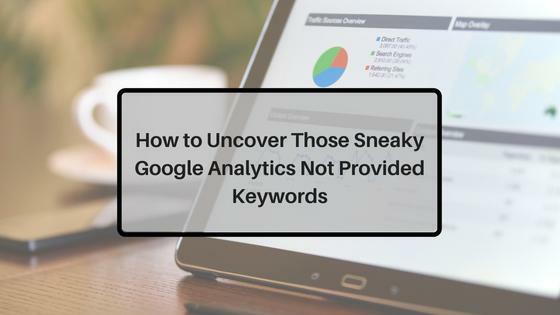 This prompted us, the Long Tail Pro team, to launch a pursuit to find the best way to unravel what these Google Analytics not provided keywords actually are. 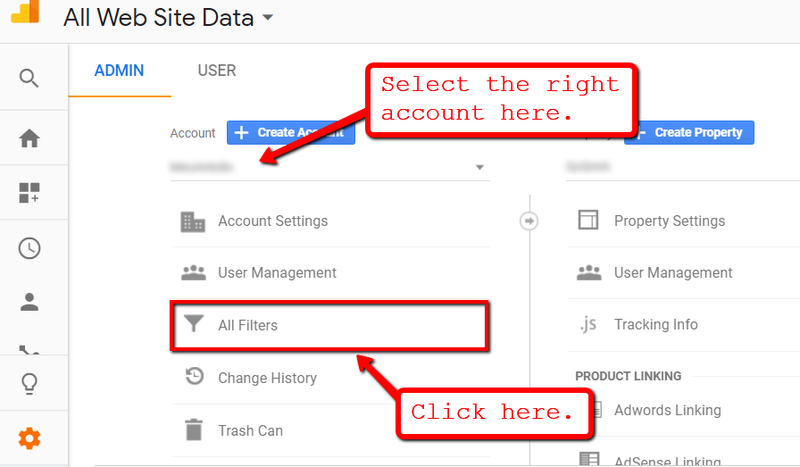 But first, here’s a quick review on how to use the keyword-tracking features of Google Analytics. 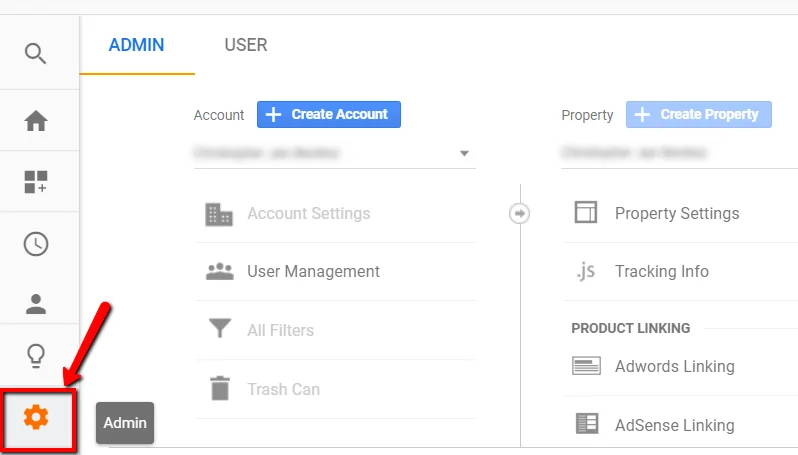 To view the keywords that your visitors use to discover your site, start by expanding the “Acquisition” menu from the main Google Analytics dashboard. From there, go to “All Traffic” and then click “Channels.” This will display all the traffic acquisition channels that currently supply your website with visitors, including referral traffic, direct, social, and organic search. You will then be able to view the keywords that your visitors use to discover your website by clicking “Organic Search” — including, of course, the Google Analytics keyword not provided. Google Analytics also generously provides metrics that will help you determine the profitability of all keywords, from the average number of pages visited per session to the total amount of traffic that each keyword gets. Ironically, the hidden keywords usually account for the most traffic that goes into your website. This is especially true if your website has been around for a while and you haven’t kick-started your online presence with a massive link building campaign. To uncover the keywords included in the ‘not provided’ group, the first method you should try is to use filters to extract these terms. Although it may not reveal the exact keyword being used in ‘not provided’ queries, creating a custom filter to segment the traffic is a step in the right direction. 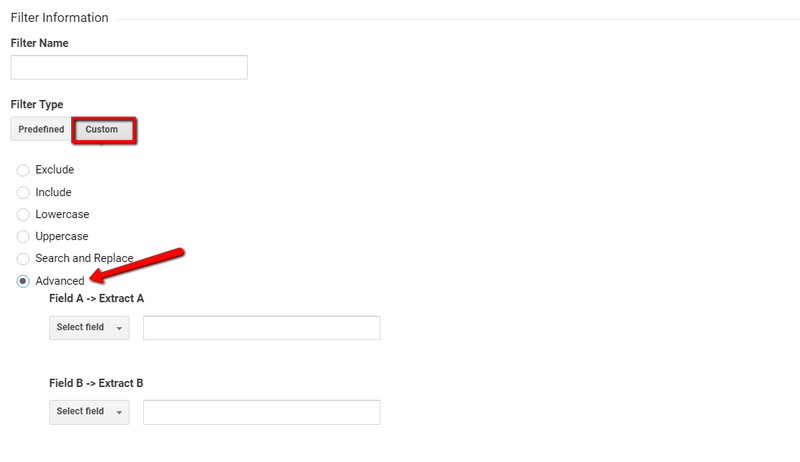 To get started, access the “Admin” section by clicking the “Gear” icon below the Google Analytics main menu. Your goal here is simple: filter out traffic from ‘not provided’ queries, extract the URL of the page where they landed, and then save the output into the keywords list. Select “Campaign Term” and enter “(.not provided. )” into Field A. Select “Request URI” and enter “(. *)” into Field B. 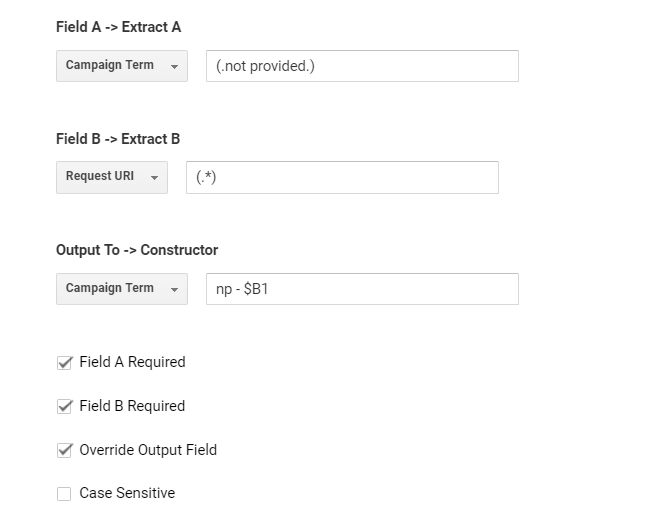 Enable “Field A Required,” “Field B Required,” and “Override Output Field” by selecting their checkboxes. Create a name for your filter. If your goal is to identify lucrative keywords you can double down on, then the behavior tracking feature of Google Analytics won’t be much help. Sure, it will help analyze the performance of your content with metrics such as bounce rate, conversion rate, and so on. The keywords that visitors use, however, aren’t covered. The next reason should be quite self-explanatory given the fact that we’re trying to unveil hidden keywords. Since Google Analytics doesn’t list the keywords that your pages rank for, you also won’t be able to pinpoint which of them are pulling in visitors that use ‘not provided’ keywords. Now that you can identify the pages that are getting traffic from ‘not provided’ queries, it’s time to drill down on the keywords that may be responsible. One way of doing so is to launch a backlink analysis with the Long Tail Pro platform. From the “Backlink Analysis” page, simply enter the page’s URL and click “Retrieve” to start your analysis. This will immediately list all the backlinks going to that page along with the anchor texts used, which will give you an idea on what the search query could be. Okay, this particular strategy may not reveal every single Google Analytics keyword not provided, but you’re definitely getting closer. The approach we’ve taken so far may take days before it can yield meaningful results, especially when segmenting your ‘not provided’ traffic with Google Analytics filters. In the meantime, you can rely on other research tools that can help you paint a much clearer picture of what keywords draw in traffic for your site. Google Search Console, for example, will help you get a bird’s-eye view of all search queries that lead to your domain. The same goes for a lot of SEO tools out there that can track your keyword rankings. This is where our pursuit of those elusive ‘not provided’ keywords comes to an end. The tactics above may not guarantee every single Google Analytics search keyword not provided, but they’ll surely help you identify some of the lucrative keyword opportunities that can further boost the rankings of your top pages. Use Google Analytics to keep an eye out for your keywords — provided or not. Filter out ‘not provided’ traffic and segment them according to which page they land. Boot up backlink analysis tools for an idea of which keywords these pages rank for. Apart from Google Analytics, you can utilize every strategy in this post with the help of Long Tail Pro. Feel free to check out our free trial here and let’s go after those ‘not provided’ keywords! When I follow your directions, I still get that annoying message “not provided”. I tried to replicate your instructions many times thinking that somehow I was making a mistake. No mistake. It just does not work. 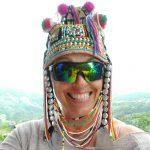 I am located in California USA. Could that be my problem? You’d want to set up filters to determine the pages that are bringing in that “not provided” search traffic. This will give you some insight on keywords being used to access the content. If I go to to Acquisition / All Traffic / Channels, I still see the majority of keywords as (not provided) ?? What an excellent way to identify pages that received traffic from these “not provided” keywords. Revealing possible lucrative keywords through backlink analysis of pages you know are already getting traffic is brilliant. Thanks Mike! Glad you enjoyed the article.